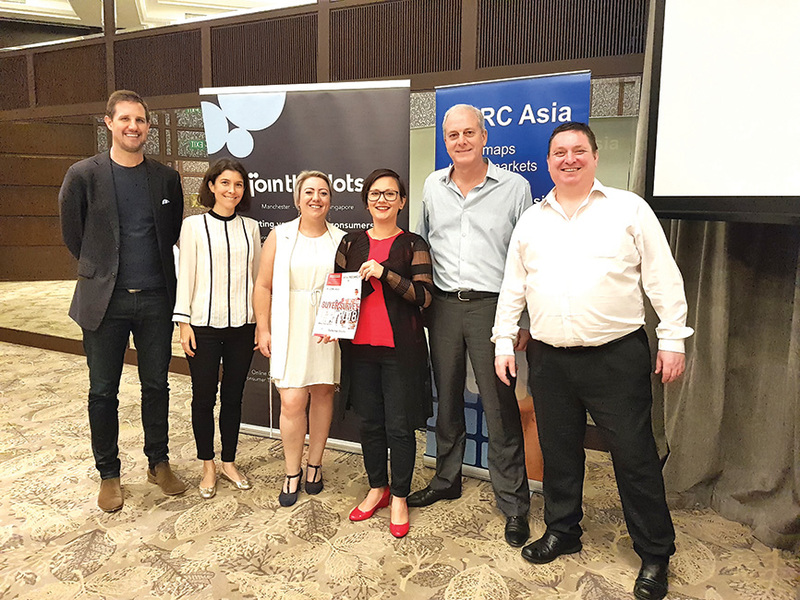 The third in the series of ‘research on research’ seminars by Asia Research Media was held at the Goodwood Park Hotel, Singapore in September 2018. The keynote paper was delivered by Piers Lee, the deputy editor of Asia Research and head of BVA BDRC in Asia, who reported on key ndings from our client research conducted earlier in the year. The in-depth client research highlighted the changes impacting the research business in Singapore, and Piers discussed some of the most signi cant implications for clients and research agencies. One of the most visible changes in the industry is the extent to which clients are insourcing their research. Most large client organisations have set up insight departments, so they can now undertake many of their own projects, particularly with access to a range of online survey methods. Beyond insourcing, clients are also nding creative ways to get more from their research budgets by using hybrid methods of online and o ine, and increasingly using other technologies such as text analytics. A somewhat worrying trend, though, is that some client organisations are willing to cut corners, summed up by what was described as a ‘proxy attitude’ – for example, over-reliance on cheaper and faster online research that can miss large populations of the lower socio-economic groups, and also poorly represent growing segments of the market, such as older consumers. However, clients seem willing to live with these omissions if the online survey appears to provide ‘su cient answers’. from an eight-country to a four-country study – and when the ndings from a survey in Hong Kong are used to inform a strategy for Singapore (the argument being that city states have similar characteristics!). But perhaps a much bigger and more threatening trend is the use of analytics. Instead of complementing primary research, some organisations are seeking to replace much of their primary research with analytics, and to substitute traditional opinion research with social media monitoring, with very little understanding of context or consumer pro ling. Despite what might be viewed as corner cutting, research itself is generally gaining status within client organisations, as it is now mandated that most management decisions need to be supported by evidence or data, hence the emergence of a new term in the business: ‘decision insights’. While research and consumer insight might be gaining status, this is relative to where it was compared to ve or ten years ago, and Piers argued that research still lags far behind Western markets. The evidence is in the data itself! Based on ESOMAR statistics, in 2016 Asia only accounted for 15 percent of global market research spend, despite the region being home to 60 percent of the world’s population and generating about a third of the world’s GDP – hence it is signi cantly under-indexed on research spend. Far from Asia catching up with the West, increasing use of low-cost alternatives to primary research, such as analytics, might actually see this this share fall. The seminar was complemented by other papers that looked at a di erent approach to product testing, and insights into System 1 thinking. Alexia Sichere, co-founder of Try & Review, talked about how consumer insights can be used to help clients develop social media marketing campaigns. Try & Review is not a market research company, but a type of new media advertising agency. Similar to many related industries, it nds itself being able to deliver consumer research through alternative approaches, and arguably with greater insight. Try & Review lets consumers test new products and post their reviews of these products online. Similar to review sites for hotels, consumers can see what other people think of these products, so as to be better informed on their own purchase decisions. Brand owners can use the positive reviews from these product tests to generate more genuine content for social media campaigns. Try & Review mainly works with digital marketing clients, but it can nd itself generating far deeper insights in its product review work compared to traditional home placement product testing. Very speci c feedback is provided on how products, packaging, and communications can be improved. Try & Review did not intend to become a disruptor to market research, but consumer insight has become a spin-o bene t to the development of the company’s social media campaigns. Likewise, their use of ‘ordinary consumers’ to generate campaigns, instead of talents and scripted advertising, delivers more authenticity in the advertising. By using genuine user content to run online adverts and drive tra c to sites, Try & Review can reduce the cost per click by up to 50 percent, and increase sales conversion. Try & Review also introduced a seal that can be used by brand owners at point of sale, like a brand award. Testers can even become brand advocates, with ‘real people’ starring in adverts and video testimonials. Among the various new methods adopted by clients in recent years is ‘getting a better understanding of System 1 thinking’. Voted Best Paper at the event, ‘Consumer Psychology 101: from Theory to Practice’ was delivered by Karen Scho eld, managing director of Join the Dots, Singapore. there is a direct association between cows and milk, we ended up thinking that cows drink milk rather than water. The third element is that consumers are very poor witnesses to their own behaviour. When you observe what people do, and then ask them to state what they think they did, there is often a big disconnect. For example, in a research project, Karen observed how people examined clothes in Marks & Spencer for their quality. When she approached them shortly afterwards to see what they had looked at to determine the quality of the item, the consumer claimed to have looked at the label (e.g. for country of origin, fabric, and washing instructions), but this was clearly not the case. It was simply the System 2 thinking kicking in to deliver more rational answers. In terms of the application (or ‘practice’) of this, marketeers can adopt System 1 thinking to their advantage. For example, ‘decoy pricing’ is used a lot at point of sale. Take a menu in a restaurant – one item priced very high, particularly at the top of the menu, can make other, relatively low-priced items seem good value, and they will then be more likely to be ordered, as in the case of desserts that people might otherwise pass on. people to describe things, or how other people might describe what they do in certain situations. Neil Gains from TapestryWorks complemented this paper with his own take on System 1 thinking, speci cally on how organisations can nd practical solutions to research the implicit, non-conscious brain, without the need to use sophisticated and often expensive neuroscienti c approaches. One way to access System 1 thinking is through sensory experiences (perception) and emotional associations. The convention is to ask consumers more direct questions rst, then to follow up with less direct approaches (or stop when the participant’s memory is exhausted). In an example of a four-country study across Asia, Neil showed that getting consumers to start with implicit thinking in response to visual cues allowed consumers to access memories, associations, experiences, and stories that would have been di cult to recall with standard market research question-and- answer approaches. The Asia Research Media event provided a range of papers that talked about the state of the industry itself, as well as the companies and methods that are now forming part of the ‘new economy’ of market research and consumer insight in Asia. In 2019 we will hold two seminars in Singapore and two in Jakarta, and we welcome suggestions for additional markets. For more information on speaker/sponsorship opportunities with Asia Research, please contact editor@asia-research.com.